You will love our homemade pizza dough stuffed with your choice of ham and cheese or pepperoni and cheese. Choose tomato, honey mustard or ranch for dipping sauce. Try a combo of both types! Eight (8) served with tomato sauce. Enjoy our authentic homemade garlic bread with cheese, served with tomato sauce. Enjoy our authentic homemade garlic bread served with tomato sauce. Our unique style of pizza will be a welcomed treat for your palate! Olive oil and garlic with sliced tomatoes, black olives, red onions and our three cheese blend. Mushrooms, red onions, green peppers, black olives, tomatoes and our three cheese blend. Ranch based pizza with buffalo chicken and bacon, topped with our three cheese blend. Pepperoni, Italian sausage, mushrooms, onions, green peppers, black olives and our three cheese blend. Pepperoni, Italian sausage, bacon, ham, beef and our three cheese blend. Ham, pineapple tidbits and three cheese blend. Pepperoni, Italian sausage, mushrooms, banana peppers, black olives and our three cheese blend. Our unique pizza starts off with our homemade pizza dough made fresh daily and topped with our special recipe sauce. Choose From These Great Toppings! All hoagie sandwiches are served with chips and a pickle. All hoagie sandwiches are served hot and finished with lettuce, tomato and onions. Enjoy layers of our roasted turkey breast with your favorite cheese. Turkey, ham, bacon, with your choice of cheese. This hoagie is full of Genoa, salami, sweet cappicola, deli pepperoni and your favorite cheese. Top it off with roasted red peppers if you like! Savor our thinly sliced ham topped with your favorite cheese. Treat yourself to shaved rib eye, sauteed onions and our three cheese blend. Breaded chicken tenders served with our spicy hot sauce. All parmesan sandwiches are served hot with our homemade marinara sauce and three cheese blend. 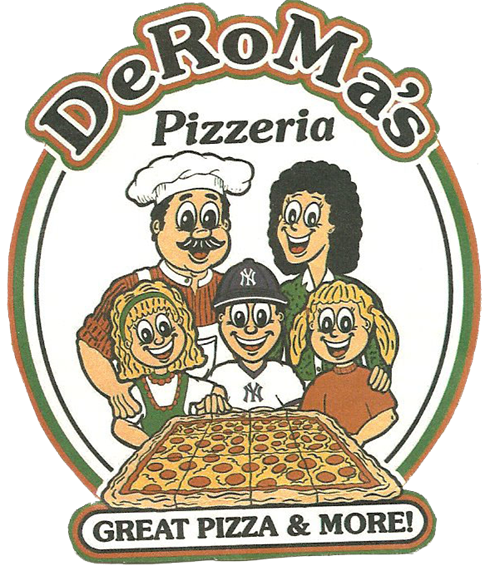 Featuring DeRoma's homemade meatballs and sauce, topped with our melted three cheese blend. Envision sweet, juicy Italian sausage links, soaked in our homemade marinara sauce and topped with our three cheese blend. Thin tender slices of eggplant coated to perfection with our homemade sauce and melted three cheese blend. Wonderfully grilled chicken breast topped with our homemade sauce and melted three cheese blend. Our salads consist of fresh local produce prepared daily. Extra Dressing For - $0.50 Extra! Overflowing with fresh lettuce, tomatoes, red onions, black olives, cucumbers and green peppers. Our Greek salad combines fresh lettuce, tomatoes, onions, kalamata olives, cucumbers, feta cheese and pepperoncinis served with our homemade vinaigrette dressing. Breaded chicken tenders served over fresh lettuce, tomatoes, red onions, black olives, cucumbers and green peppers topped with provolone cheese. Fresh lettuce, tomatoes, red onion, green peppers and cucumbers with ham, turkey and Swiss cheese. A tasteful combination of fresh lettuce, tomatoes, red onions, black olives, cucumbers, green peppers, stuffed sweet cherry peppers, provolone cheese, Genoa salami and cappicola ham. Perfectly cooked pasta shells, generously filled with ricotta cheese and topped with our homemade parmesan sauce, three cheese blend and served with garlic bread. Perfectly cooked pasta, rolled and filled with ricotta cheese and topped with our homemade parmesan sauce, three cheese blend and served with garlic bread. All desserts are personal size. A classic Italian dessert, consisting of lady fingers and mascarpone cheese with a hint of coffee. Oreo cookie crust with a creamy pie filling with even more Oreo bits! A light fluffy cake infused with limoncello liqueur. Rich and cream, with deep chocolate flavor. Soft and chewy, these brownies are rich with chocolate flavor.